After playing countless hours of Rocket League, I wasn’t sure how well the typical sport games would hold my interest. Sure, I still watched sports on TV, after the innovation and hype of Rocket League, I didn’t know if I would be able to play other sport video games and still get the same amount of excitement and enjoyment out of them. Well, after playing just a few minutes of Pro Evolution Soccer 2016, I realized how stupid I was for worrying about that. One of the first things I noticed after starting up my first exhibition match was just how smooth the gameplay is. The players all made their way down the field in succinct, fluid motions, the ball effortless changed players, and the dribbling seemed, well, natural. It felt like an actual game of soccer, and it also felt like a major jump from PES 15, which at times seemed stuttery and mechanical. Everything in PES 16 feels organic, and it captivated me instantly. The biggest reason for such silky smooth gameplay probably lies within the game’s animations. There are so many of them, and they come into play in interesting ways when passing, shooting, or simply moving around. When dribbling the ball, for example, it doesn’t just look like the ball is mechanically going back and forth between the player’s feet. No, instead, it moves around in a way that looks like the player is in control of it, yet it might come loose at any second. It other words, it looks realistic. The same goes for shooting. I’m not entirely sure that I’ve seen the ball get knocked into the net the same way twice, despite watching countless goals. The animations all seem subtlety different, and while this is maybe due to all the different shots one can use, or maybe due to the little differences in all of the player models, it makes the video game feel more like the actual game of soccer. That smooth gameplay is also achieved by the added physicality in PES 16. There are so many more collisions and tackles than I remember seeing in past PES games, and it’s fantastic. 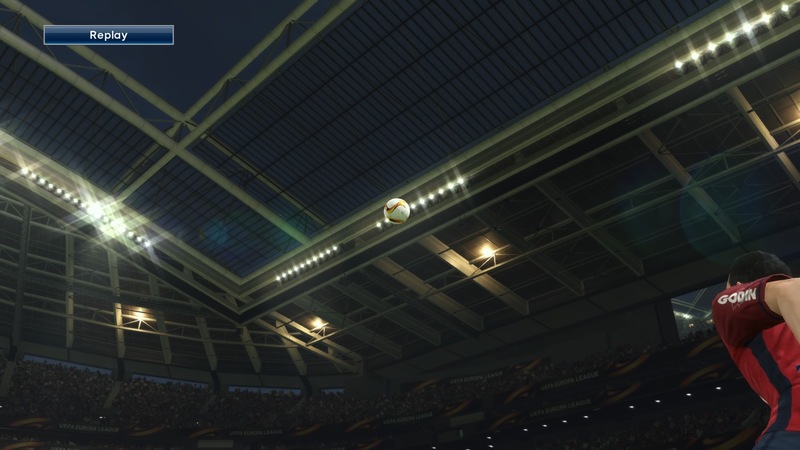 The ball is constantly changing sides, and AI players are quick to nip at your heels or try to knock the ball away from you. The constant, physical battle for the ball makes the game seem more fluid, as it changes possession frequently and unexpectedly. I also noticed that the refs are a bit more relaxed when performing heavy duty tackles or slide tackles. As long as the tackling player touches the ball, it seems, it doesn’t matter if the other player gets sent ten feet into the air or not. While this might bother some soccer fans, I felt it made the game a bit more exciting. However, I did notice another issue with tackling, one that isn’t all that great. When looking at close-up replays, I found that the collision detection is a bit off. Frequently, when tackling, one player’s limb might go inside of another player’s limb, or their foot might go right through a player’s head. At the same time, a player might go flying from a hit, but, upon closer inspection, the opposing player was a good foot away from him. While it’s impossible to notice this during the gameplay, it does make the replays a bit awkward at times, and unrealistic. However, those issues are small in the face of the near perfect gameplay. But, if the core gameplay isn’t really your thing, then PES 16 offers two more strategic modes — myClub and Master League. In myClub, players are tasked with essentially creating a team from scratch, using players they unlock through a lottery type of system to do so. They then can play against AI or human players, competing to win different tournaments and matches. There a distinct RPG element about the mode, as after every match, the team gains experience points, and the team members can level up and increase their stats. Master League also has a great deal of strategic and RPG elements. In this mode, players essentially take on the role of manager, meaning they have to balance a budget, recruit and trade players, develop gameplay strategies, and more. The mode has been revamped since PES 15, now offering a better interface and more player acquisition options. On top of that, it features an incredibly in-depth character creation screen, which allows players to create their own manager. While it takes a little while to get the hang of, Master League can be as interesting and advanced as many strategy games currently out there. Thanks to the smooth, physical gameplay, the amazing animations, and the various and strategic game modes, PES 16 is easily the best title in the franchise. To go one step further — PES 16 is likely one of the best sport games out today, and despite a few minor annoyances, it is a must buy for anyone with even a remote interest in soccer. PES 16 review copy provided by publisher. Reviewed on PS4. For information on scoring, please read our Review Policy here.